Anonymous or private browsing on Windows! Anonymous or private browsing on Windows 10 is easy with the famous and fast edge browser! Please start the MS-Edge and open the Page in Anonymous-Mode, it is easy! Simple do a right click on the link that you want to open in Private ergo Anonymity-Mode. (Image-1) Anonymous or private browsing on Windows-10! 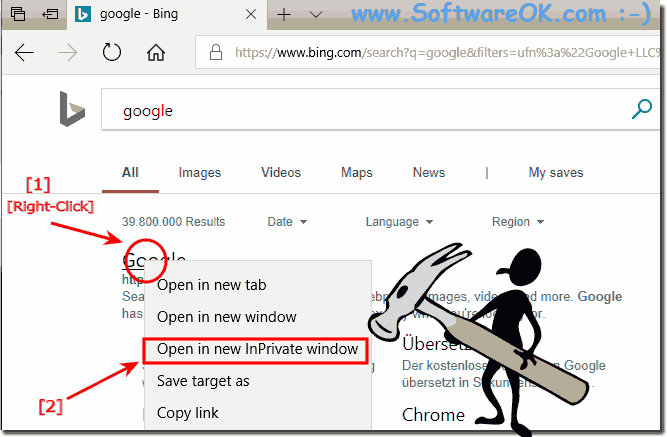 This-and-That-or-Other - FAQ-4: Anonymous or private browsing on Windows! ist valid for Microsoft (c): Windows 10: Pro, Enterprise, Home, Windows and 8.1: Enterprise, Pro, Home Windows 7: Enterprise, Home, Basic, Premium, Professional, Starter, Ultimate Windows-Server 2016, 2012, 2008, 2005 . Ho to use the IP-Telephone on Windows-PC and free or cheap? LED TV / TV, LCD TV, or Plasma? Microsoft Server 2016 and 2012 Difference? What is an atomic clock how to use?